Memory fails me when it comes to the details of this game. This is probably because it took place on the same day that the Grand National was postponed due to an IRA bomb scare at Aintree. I had to queue up for an age at a bookie’s on Easter Road to get my stake back, since I was returning to Cambridge the next day. If I’d let the bet ride for when the race was finally run on the Monday I would have had about £50 to collect on my next trip north. Story of my life. Anyway, history records that Hibs won this match 2-0 thanks to a Chic Charnley penalty after 73 minutes, the concession of which also led to Steven Pressley being ordered off. Pat McGinlay secured the points five minutes later. With Motherwell only drawing at Pittodrie Hibs were five points clear of the dreaded play-off spot. Unfortunately the results were reversed the following weekend and when Motherwell won improbably at Ibrox on the second last day of the season while Hibs went down to Celtic the teams were tied on points with Motherwell crucially ahead on goal difference. A nervous final Saturday lay in store. London Hibbies might like to scrutinise the photo below and see if they can name the three members to Phil Larner’s right, snapped while celebrating Phil’s 50th birthday (and a 2-1 Hibs win at Aberdeen) in the Forthview restaurant at Easter Road. Leave a comment if you recognise anyone. 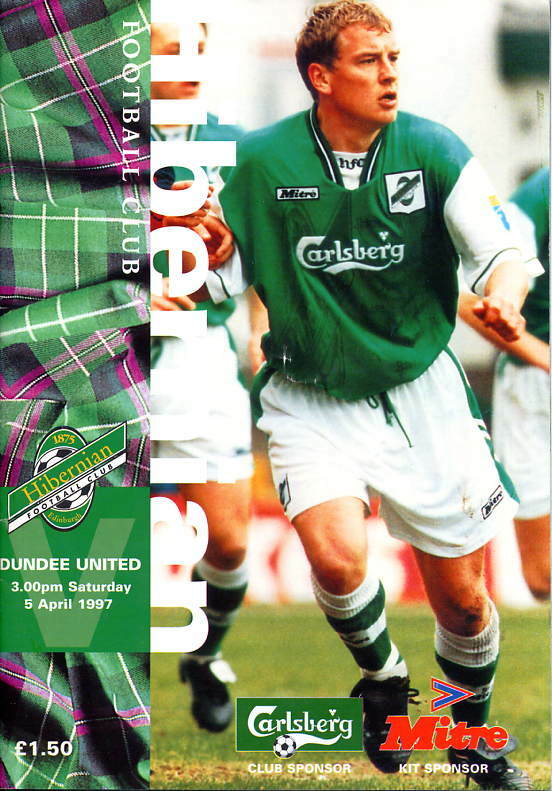 Categories: Programmes | Tags: Chic Charnley, Dundee United, Easter Road, Grand National, IRA bomb scare, London Hibs, Pat McGinlay, Steven Pressley | Permalink.